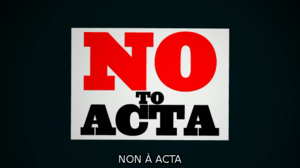 Difference between revisions of "How to act against ACTA"
The European Parliament will vote on ACTA and still has the occasion to reject it once and for all. Contacting your Elected Representatives is the most useful thing you can do right now, and until the final vote in the European Parliament. To get a clear view of the parliamentary process, visit our page ACTA: Procedure in the European Parliament. We need to act at each step of the parliamentary process in the European Parliament. Each of these steps is an occasion for us to make ourselves heard against ACTA. 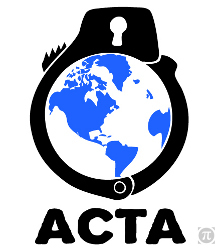 This week, from the 23rd to the 26th of April, it is an important ACTA week in the European Parliament. It's a perfect opportunity to contact MEPs! To be informed about the next steps to urge Members of the European Parliament to reject ACTA, send a blank email to NOtoACTA-subscribe@laquadrature.net to subscribe to our list (we won't use your email for anything else). To easily get in touch with the right Members of the European Parliament, you can use our PiPhone. This tool will connected to a Elected Representatives free of charge. If you enter your country, you will be connected to an MEP speaking your language. Several EP committees are responsible for producing reports that will be put to vote along with the vote on ACTA as a whole. You can call each of the committees below to tell to them what you think of ACTA, and that you want their report to convey your opinion as a citizen and to recommend the rejection of the agreement. Call MEPs from the "International trade" committee (INTA) and tell them why they must recommend the EU Parliament to reject ACTA. Call MEPs from the "Civil Liberties" committee (LIBE) to tell them why ACTA undermines fundamental freedoms. Call MEPs from the "Industry" committee (ITRE) and tell them how ACTA would undermine growth and innovation. Call MEPs from the "Development" committee (DEVE) and remind them that ACTA was designed against the interests of developing countries. Call MEPs from the "Legal Affairs" committee (JURI) to tell them how ACTA would impact EU law. If you are still uncomfortable, you can find an example phone call here.